The Torch was a 1930 pamphlet produced by the editors of the Philippines Mail newspaper (published in Salinas) to address special issues of concern to the Filipino Community in Monterey Bay Area and Salinas Valley. 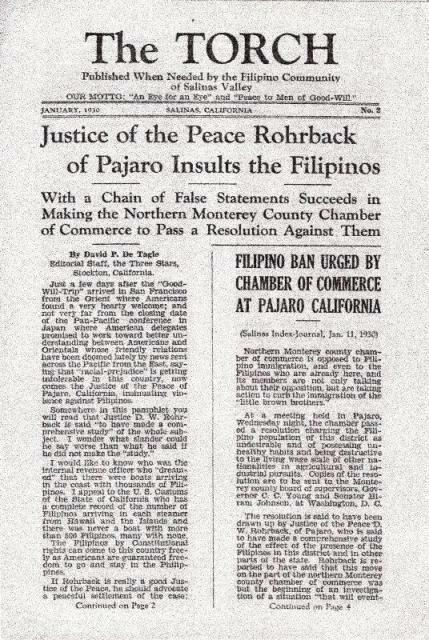 This particular issue is a response by David P. De Tagle (an editor for the Three Stars, another Filipino newspaper located in Stockton) to remarks about Filipinos made by Judge Rohrback of Pajaro, and the Monterey County Chamber of Commerce. To read or download a free pdf copy of The Torch, click on the link below the image. The Torch, from the Abe_Ignacio Collection. Pdf copy of The Torch courtesy of historian and archivist Abe Ignacio. See also The Forbidden Book: The Philippine-American War in Political Cartoons, by Abe Ignacio, Enrique de la Cruz, Jorge Emmanuel, and Helen Toribio.